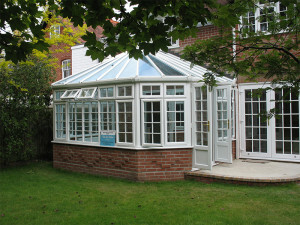 We can construct and install conservatories throughout Hampshire and Dorset such as Southampton, Winchester, Bournemouth, Lymington, Romsey and the New forest and Waterside area. 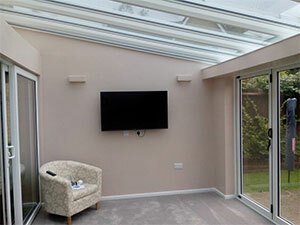 Whatever the size or shape we can supply and install your conservatory. The conservatory roof we use is the Global roofing system . Whichever you choose, every conservatory is backed by high levels of quality manufacturing and a experienced installation team. The footings will be dug to a depth of 600mm and filled with concrete to just below ground level. Concrete lintels will be used to cross any drainage pipes. The bricks and internal block work will be laid to damp course level and the concrete base will be laid on a layer of 50mm insulation and damp proof membrane. The external and internal walls will be built and fitted with 25mm insulation in the cavity. After the conservatory has been erected the internal walls will be finished to a plastered finish ready for your decoration and window boards fitted. The final floor covering of sand and cement screed will be laid after completion of the conservatory frames and roof to the exact height of the house floor height so there will be as little a step as possible into the conservatory. If underfloor heating, tiling or decorating is required this can be arranged. Our conservatory roofs structure is constructed using aluminium capped with UPVC, which is available in many different colours. The roof sheets can be constructed using either glass or polycarbonate. The glass roof is available in either double or triple glazed. Glass roofs come in four colours, which are: Blue, Green, Bronze, and Neutral. Polycarbonate roofs come in four colours, which are: Clear, Bronze, Opal and Heatshield Opal.